Project Title: City of Sanibel's Sea Turtle Lighting Campaign - "After 9, it's turtle time!" Summary: With occupancy at or near full capacity in 2014 and anticipating the same in 2015, the City of Sanibel is will initiate an educational campaign that will remind residents and visitors that both interior and exterior lighting sources can impact sea turtle nesting and hatching. Specifically, the materials and education campaign will place a renewed emphasis on the potential effects of unshielded interior lighting and will complement existing educational materials that focus on the minimization of impacts from exterior lighting sources. Three strategies will be employed to educate island residents and visitors that "After 9, it's turtle time! Help sea turtles by turning off all unnecessary lights and closing curtains and blinds after dark." 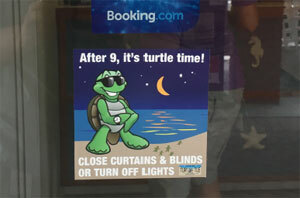 This message along with sea turtle imagery will be displayed on 1) lighting stickers, 2) static cling window decals, and 3) elevator decals and distributed to island rental agencies, management companies, and condominium managers. Although most summertime visitors to Sanibel receive some information regarding sea turtles at "check-in", the goal of this program is to provide additional reminders at key locations--light switches, windows and sliding glass doors, and elevators--that helping sea turtles can be as easy as flipping a switch.